I found an eatery recently which accomodates 'BYO wines'. Its a big place; and it being located on the ground floor of a building catering to light industries comes as a curious surprise. 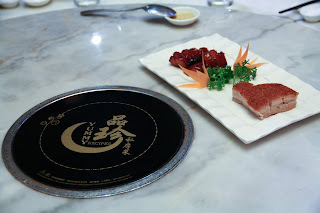 The size allows Yummy Recipes to offer 180 seatings at any one time comfortably. But what surprises one more than the size or its location is the decor within. 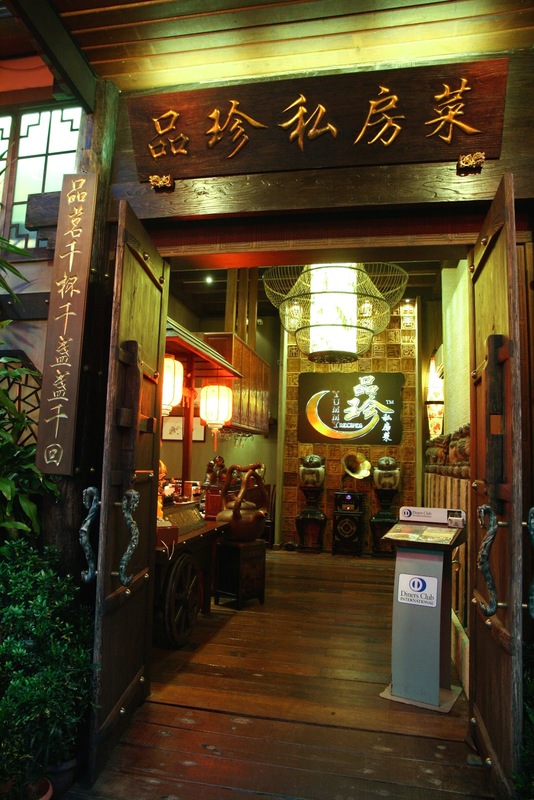 Enter into this place and you get an idea of what a reasonably well doing inn from early 20th century China would have been like. The design and decorative pieces within certainly bring you back in time. The sitting layout have been separated into 2 sections. One end caters to small groups of 2-4 people and the other caters for larger groups of 8-10 per table. There's 'sliding walls' in between each large table which can be moved to create private enclaves of varying sizes. 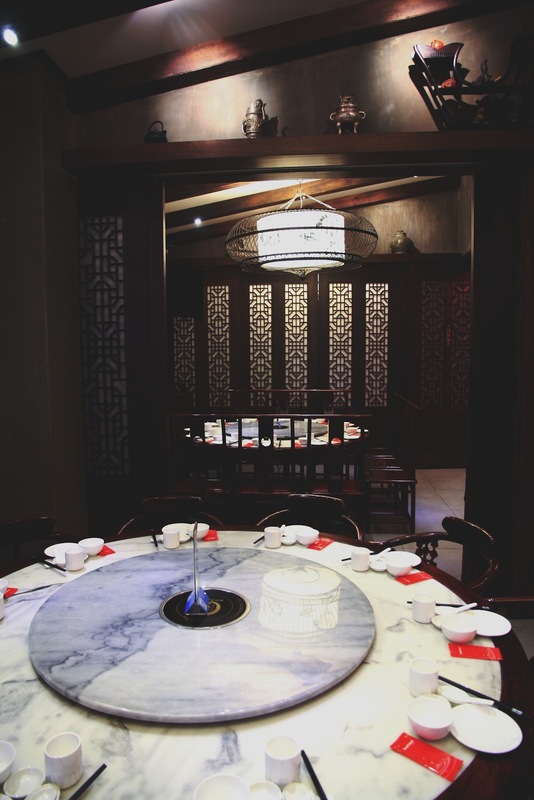 Be it a big family gathering requiring one table or a company dinner needing a few tables, this eatery can certainly accomodate your needs. It welcomes wine drinkers who want to 'BYO wines' as well. They have wine glasswares for sparkling, white and red wines. These are generic restaurant type glasses (so if you are particular about glassware for your cabernets and pinots, it will be advisable to bring along varietal specific glasses. I know folks who happily do that for wine dinners they organize with friends; its more than alright). This eatery also carries a couple of decanters at hand and is more than happy to provide ice buckets for your whites and bubblies. Its mainly Cantonese cuisine over here. Place closes at 11pm. 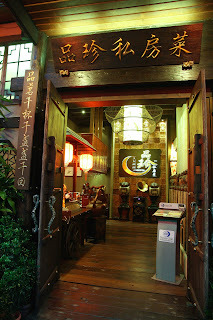 However, if you want to sip for longer hours, you can request to shift to seats placed outside the restaurant. If you are the sort who loves to pair wines with chinese cuisine, this would be a place to check out. Call Ms Katherine over there and she will assist you with your 'BYO wine' needs. (Note: Its always wise to call a restaurant about its current BYO policy (before going down with your wines) as things in life have a tendency to change). I've previously received some queries on where to purchase PVC ice bags in Singapore. I saw a couple being used recently during a wine tasting event held by Essential Wines and obtained a contact via them for this product. 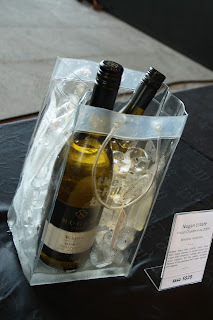 It makes for an easy, light, stylish wine carrier bag (they come in different colours); something convenient to chill wine bottles in; foldable when not in use and reusable next time you have a need. “Sweet wines from other countries please”, so came the request from the Qiao sisters recently. 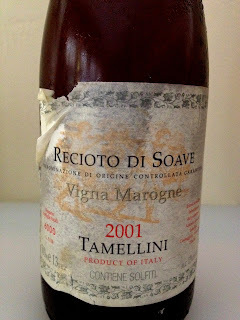 I’ve known these ladies awhile now and their love affair for most things sweet; wines included. Their usual 'hunting grounds' for sweet wines are Canada, France and Germany. This time round, however, they were looking for options from other countries to delight their colleagues and friends with. I managed to identify a few local purveyors of sweet wines for their ‘sipping’ pleasure. If you are looking for something different to try this season, these wine merchants may just be able to assist you as well. 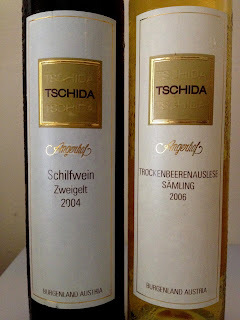 Do you like late harvest wine from Germany, the botrytised wine from Sauternes or ice wine from Canada? If so, you'll like Austria. Austria offers good alternatives from auslese, spatlese levels to schilfwein, trokenbeerenauslese and ice wines too. Some grape varietals used in the making of Austrian sweet wines are welschriesling, gruner veltiner, samling, chardonnay, riesling and muskat ottonel. Local merchants: Unique Food & Wines (ph: 94504322), Ponti Wine Cellars (ph: 67330369), The Straits Wine Company (ph: 8888333) and www.ewineasia.com (an on-line wine sales platform) carry Austrian sweet wines of different styles. Like Austria, Italy offers a variety of sweet wines as well. In terms of ‘sweet and sparkling’ ones, there are the ‘white’ Moscato d’ Asti and the ‘red’ Brachetto d’ Acqui. There’s also the ‘sweet, still white’ ones made from Muscat of Alessandria and Garganega varietals; not forgetting the ‘red, still’ Recioto from Valpolicella. Another famous sip, Vin Santo wines (made with Trebbiano and Malvasia grapes which are dried in straw mats prior to fermentation) come from Tuscany. These are similar to ‘passito’ wines produced in Apulia and Lazio regions (made with Aleatico grape varietal). Local merchants: The Straits Wine Company is well known for its Villa M (moscato d’asti) and carries the Luna Nuova Vin Santo from Chianti as well. Auric Pacific Marketing carries Banfi’s Brachetto d’ Acqui. FBI Wines (ph: 65091030) holds vin santos, reciotos and brachetto d’ acquis as part of its portfolio. Angara Wines & Spirits (ph: 65327791) carries a Vignamaggio vin santo and a Pantelleria passito liquoroso. 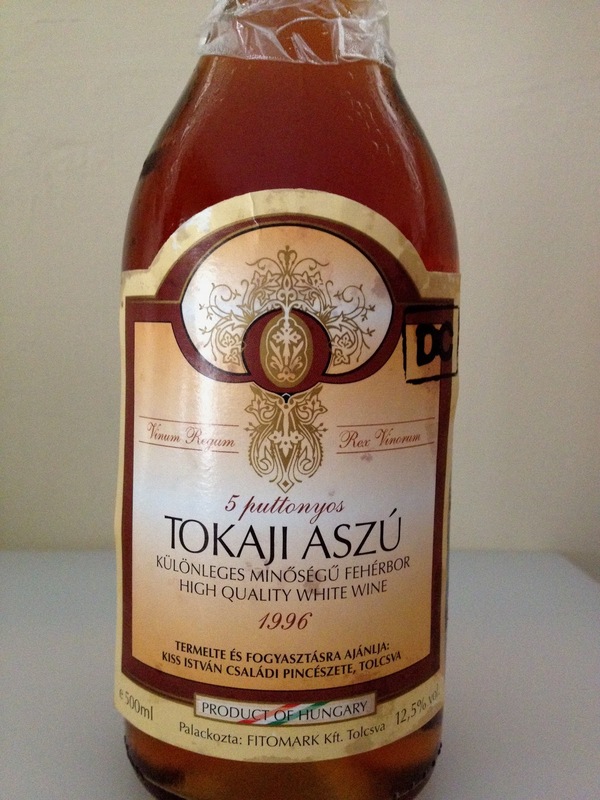 Tokaji wines. At one point in history the sweet wines from Hungary were more popular than their French counterparts from Sauternes. 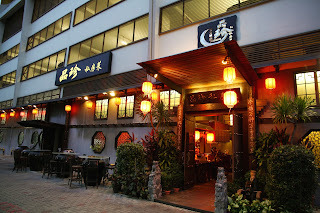 Popular in Singapore are the Aszu and Aszu-Essencia styles. (The highest level, the ‘Tokaji Essencia ‘, is pricey, limited in supply and slightly hard to come by). Grape varietals used for these sweet wines are Furmint, Harslevelu and 4 other approved varietals. Botrytised grapes are used in the winemaking process to yield the sweetness these wines show. Aszu wines range from 3 to 6 puttonyos (as can be seen on wine labels). Aszu-Essencia holds a sweetness level higher than 6 puttonyos . The Tokaji Essencia displays the highest level of sweetness among these sweet wines. Local merchants: Wine Tatler (ph: 64636870), Unique Food & Wines (Ph: 94504322) and The Straits Wine Company (ph: 8888333) carry a range of Aszu wines from 3-6 puttonyos and the Aszu-esscencia as well. 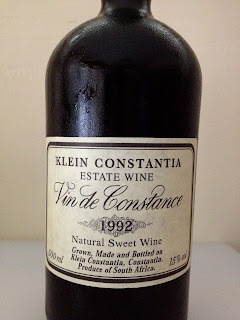 Vin de Constance is another sweet wine with some history behind it. If one looks at wine history, this sweet wine will be known to have held its own in European courts of centuries past. Though neglected for a period, in recent times however, it’s showing a revival in the district of Constantia (in S.Africa) where it’s produced using the Muscat blanc a petits grains grape varietal. Local merchants: The Wine Club (www.wineclub.com.sg or ph:65933572); and www.ewineasia .com carries the Klein Constantia Vin De Constance. Received queries recently asking advice on wine courses for the coming year. I am listing below some of the course providers in town and a few sites which can provide additional information. If you are contend on knowing about wine alone, then the courses from Singapore Polytechnic should be able to provide relevant knowledge. If you want to study about spirits as well, then the WSET courses may be more ideal. There are wine enthusiasts who first begin with the Singapore Poly certificate and then at a later date go on to take up the WSET courses as well. If you are keen to seek employment as a sommelier or beverage manager, then the Court of Master Sommelier accreditation may be more appealing as it covers 'other beverages and service' part as well. This course is well received in Singapore within the F&B community. The recent years have also seen good interest from those in the wine community for the Certified Specialist of Wine (CSW) accreditation. Apart from those in the wine trade, others like writers, wine hobbyists and serious enthusiasts have gone on to obtain this certification. Wine & Spirit Education Trust (WSET). There are 2 course providers in town who can help you. (To what I hear, the upcoming Level 1 is on 19 Jan 2013; Level 2 on 23 Feb 2013 and Level 3 on 2 Feb 2013. You can contact them for more info at 65478179). This is a local wine certificate awarded by Singapore Polytechnic. It has conducted more than 20 intakes of this course. The next course commences in 21 Jan 2013. Information can be found at www.sp.edu.sg (look under 'Continuing Education and Short Courses'. This course is also conducted by Singapore Polytechnic. The next intake starts on 20 Feb 2013. Information can be found at www.sp.edu.sg (look under 'Continuing Education and WSQ courses'. Have a good year discovering wines. I came to know that Russian wine producers are taking part in this year’s fair for the first time. So making some time, I visited them to learn a little about wine production there. 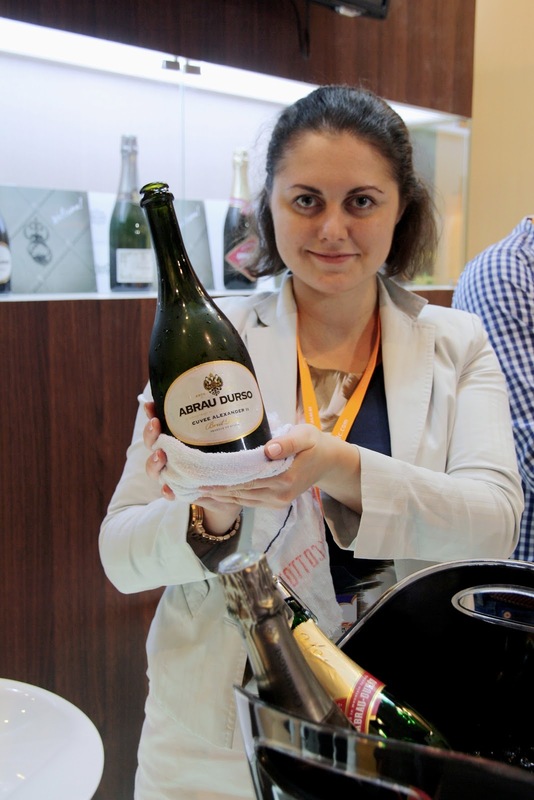 The sparkling wines from Abrau-Durso came as a pleasant surprise. The exhibitors highlighted that this is the oldest and largest Russian Sparkling Wine House. It came into existence via an Imperial edict by Tsar Alezander ll in 1870. Since then, it has been serving the powers that be from those of the Russian Imperial Court to present day Heads of State. French winemaking know-how plays an important role in the crafting of these sparkling wines. ‘Methode tradionelle’ has been embraced since 1896 (under the influence of Prince Lev Golitsyn). These wines, when undergoing secondary fermentation in bottles, are kept in mountain tunnels which run over 5.5 kilometres! Abrau-Durso Cuvee Alexander ll, Brut (made with Chardonnay, Riesling, Pinot Blanc and Pinot noir). Abrau-Durso Cuvee Alexander ll, Brut Rose (made with Pinor Noir). Abrau-Durso Victor Dravigny, Rouge, Semi-sweet (made with Cabernet Sauvignon). Champagne Foliage, Extra Brut (made with Chardonnay, Pinot Noir, Pinot Meunier). 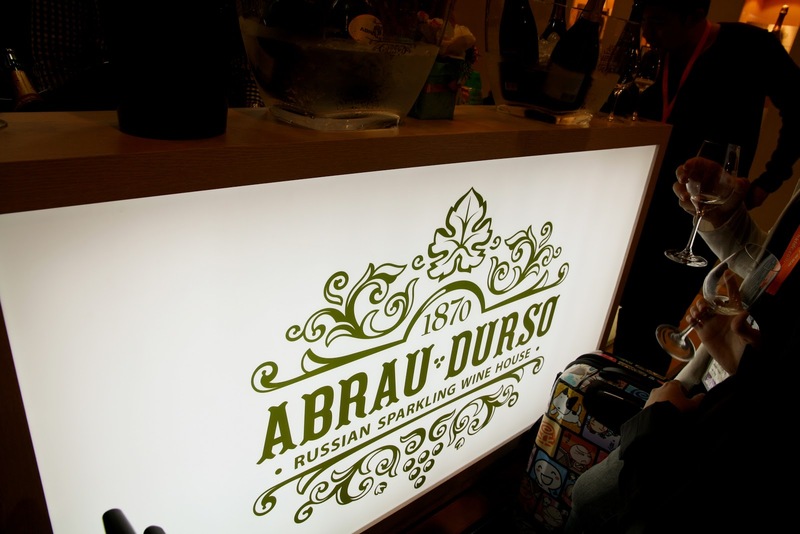 Abrau-Durso Russian Sparkling Wine, Brut (made with Pinot Blanc, Pinot Noir, Chardonnay, Aligote and Riesling). 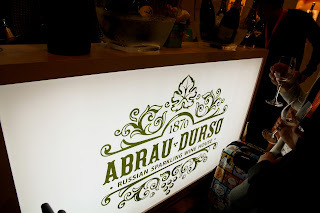 Abrau-Durso Russian Sparkling Wine, Demi-sec (made with Pinot Blanc, Pinot Noir, Chardonnay, Aligote and Riesling). Pleasant in palate and of good structure, I learnt from the exhibitors that these sparkling wines can be found in Singapore at Buyan Russian Restaurant & Caviar Bar, 9 Duxton Hill, Singapore 089593.